Today was long, and I’m realizing that tomorrow’s going to be worse. Not sure how I’m going to get through this all. Cross your fingers for me! Well, I figure I’ve written enough about me for one day, so instead of writing another entry I’m just going to take the survey I did today and post it here. I figure that opens it up to a different group of people. 2.Diamonds or pearls? I’m not much of a jewelery person overall… so I can’t say I have too much of a preference. I guess though that when I do buy jewelery it’s usually diamond looking… so I guess that’s my preference. 5.What did you have for breakfast? Yeah, I’m with Alan, it’s a miracle that I HAD breakfast today. I ate a bagel on my way out the door. 6.What is your middle name? Hahaha! Wouln’t you like to know? Ok ok, so it’s not that big of a secret… I don’t have one. 7.What is your favorite cuisine? I just like trying new things, I’m not too particular. Maybe mexican? I eat almost nothing but quesadillas… but that’s usually because they’re so easy to make. 9.Your favorite Potato chip? umm… i actually prefer tortilla chips, is that valid? 10.What is your favorite CD at the moment? hmm. well I’ve been kinda just listening to music at random. I just like listening to lots of music. But my most played song in iTunes is “Drops of Jupiter” by Train. 14.Favorite item of clothing? probably my Young Ambassador warm up jacket from last year, it’s just so dang comfy! 15.If you could go anywhere in the world on vacation? Europe, definitely Europe. I have to find a good use for all of those years of French at some point. 17. Favorite brand of clothing? Not big on brand names, I can usually find some good stuff at Old Navy or Kohls though. 18.Where would you want to retire to? I don’t think I want to “retire” per se, I want to always be active. 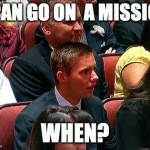 Hopefully when I get to the age when I could retire I’ll be able to go out and serve missions and do stuff like that. 21.Favorite sport to watch? Probably basketball, but I’m starting to really like watching volleyball. But I think I’d rather play than watch in all reality. 23.Person you expect to send it back first? Let’s be honest, I’ll be surprised to get a reply period. 27.Do you have any pets? Do my little brothers count? 34.Nicknames? I have lots, although apparently I should change my name to Jessica because people seem to think that I am a Jessica (random people too, ones who don’t even know the same Jessicas) I used to go solely by “Britt” but now only people who I’m really good friends with call me that. 38.Ever been toilet papering? Definitely yes. Best story: the first time I went T.Ping my mom came in while my friend and I were having a sleepover at my house to see if we wanted to go with her. Don’t even worry, my mom IS the coolest person ever. 40.Been in a car accident? well if the question is a car accident then no. If the question is 3 car accidents then yes. 42.Favorite day of the week? I like most days of the week. Mondays and Wednesdays can be kinda brutal though. 43.Favorite restaurant? Probably Costa Azul, at least it’s the one I go to most often when I go out to eat. 44.Disneyland or Six-Flags? They’re both so expensive I have a hard time justifying going to either one.. but it kinda depends on the group. Six Flags has the better rides, but Disneyland… well it’s Disneyland! 45.Favorite ice cream? I’m with Alan- homemade ice cream rules! I like ice cream with stuff in it – chocolate, peanut butter, brownie bits… whatever, just so long as there’s fun stuff in it. ← Rachel Stutz is my hero! !